Khewra Salt Mines are located in District Jhelum, Punjab, about 160 kilometers from Islamabad and a short distance from Lahore. It is the second largest salt mine in the world and situated in the foothills of the beautiful Salt Range; they are the oldest in the sub-continent. Salt has been mined here since 320 BC, in an underground area of about 100 sq. km. Khewra mine has estimated total of 220 million tones of rock salt deposits. The current production is 325,000 tons salt per annum. The mine-head buildings have 17 stories, with 11 below ground. The salt-mine extends around 2,400 feet inside the earth from the mine-mouth. There are 17 working levels and the cumulative length of all tunnels is more than 40 km. Tourists travel down a railway into the mine where there are several chambers and vaults. Beautiful sculptures adorn the walls, lakes are formed, and statutes and mosques with tunnels are made into the rock. A small café provides refreshment to tourists. There is a small museum at the mouth of the mine. Salt occurs in the form of an irregular dome like structure. At places the rock salt is 99% pure. 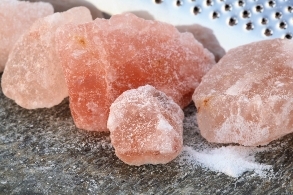 Salt is transparent, white, pink, reddish to beef-color red. There are beautiful alternate bands of red and white color salt. When Alexander The Great visited the sub-continent, coming across the Jhelum and mianwali region, Khewra Salt Mines were discovered. The discovery of the mines was however was not made by Alexander nor his "allies", but by his horse. When Alexander's army stopped here for rest, the horses started licking the stones. One of his soldiers took notice of it and when he tasted the rock stone, it was salty thus leading to the discovery of the mines. There is also a ‘love-wall’ which, it is said, if you and a loved-one’ kiss this wall; you will all share a lasting deep love!